Observations-date: April 12th., 2000, Time: 02:00 a.m.
"Theoretically speaking there shouldn't be anything wrong with the idea that there could be other civilization in space, which is far better equipped, perhaps both physical and technical than we are, and maybe they find it fun to keep us a little under observation, and look at what we are doing." "I have a forest here, and I´m looking after it , by nature I am not a "forest worker", so I´m quickly getting tired from working in the forest. But at the end of March, there was a day, where I had worked much in the forest, and I was very tired, and I went early to bed. I think that I went to bed, I think it was around 8.30pm. As a result of this, I had to go to the bathroom in the middle of the night around, two o'clock I woke up, and had to visit the bathroom, but I sleep at the first floor, so I was not much for it since it was a cold winter night. 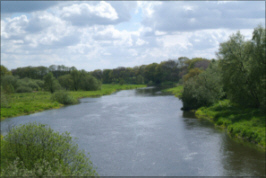 Gudenaa, the river where the UFO was observed by more witness. Half an hour has gone, and by now I all awake, and had to go to the bathroom. And as always, I look out the windows to see how the weather is, I have such a small window above my bed, and the night is fairly calm with wind from west, and there is little frost or new snow, it´s cold. 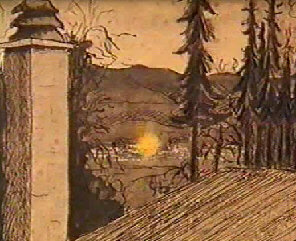 But, the first that caught me eye was something that looked like a fire, in the meadow some 500 meters from my window. I then went downstairs to go to the bathroom, and when came up, I went to the windows to look at the fire again, before I went to bed , I was amazed!. It was not there. Well, it was there, but not in the same place! It had moved a little longer down the creek, to the west, in other words to the left. So, now I was aware that it was not a fire, it may therefore be something extraordinary. So I ran through my office and out to the balcony where I would have a better view. It is certainly something resembling a fire, roughly the same shape as a tulip onion, small in the top and wide at the bottom. The edges are flossy, and it´s a strong Orange color, and it´s sparkling, that's probably the best word for it. And then I can see that the throbbing in intensity, quite regularly, approximately once per second, but completely regular. It´s strong weak - strong - weak. 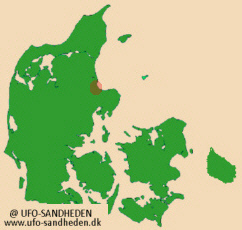 Drawing illustrating Willy Busk Nielsen's UFO occurrence above the Gudenaa. Furthermore, the fire/view is not down on the ground, it´s all the way down at Gudenaaen, and that's about three to four meters above the water. I am surprised that the strong orange light it emits don´t reflects in the water, however, there is a strong neon-blue light at the front and back. In addition, I see that it is moving steadily and quietly to the West, that's against the tide of Creek, and against the faint wind, which is out there. It is moving quite silent, and it´s a calm night." The chief physician searched for more witness to the observation in the nearby village (Ulstrup). He continued his investigations for 2 months, but stopped after 2 months, for as Mr. Busk Nielsen says: "It is a little frustrating to go from house to house, and ask whether they have seen ghosts, right?". And he continues: "I thought, I´m just going to the last house, which is completely down by the creek in the little town, Ulstrup. I ring the bell, and the wife opens the door, and I ask her if they saw strange thing lights down by the creek. No, we have not she said, we have not, we are asleep at that time of night. I apologized, and went back on home. As I was walking, she open the door and say to me, when was it again ? She called her husband 'Peter, was that the night we came home from a party in Bjerringbro'. Yes, he said.."
"We had been to a party and came home late, I believe it was around 02:30 a.m., we were going here through the small streets and looked down to the right, I think I see something burning down there. But as we are turning the car, to look at it, it suddenly disappears." "In addition to my examination down at Gudenaaen, people pretty much told me the same thing. Several had some experiences, they never really had dared to tell, because they were afraid to be a laughing stock. And I have collected about 10 and 20 reports, on UFO experiences. There are plenty of people, which has seen things. And they may not be swindlers all together.